Salmon Dream is a beautiful Peony with an unique pink color. The semi double and well formed flowers are carried by strong massive stems. Every year older the plant gives more double flowers. No side buds. Salmon Dream is one of the first pink peonies to bloom. Reliable Peony for cut flower production all over the world. Also suitable for landscaping in gardens and city parks. 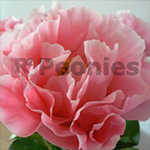 For ordering Peonies contact one of the R2 sales employees underneath.